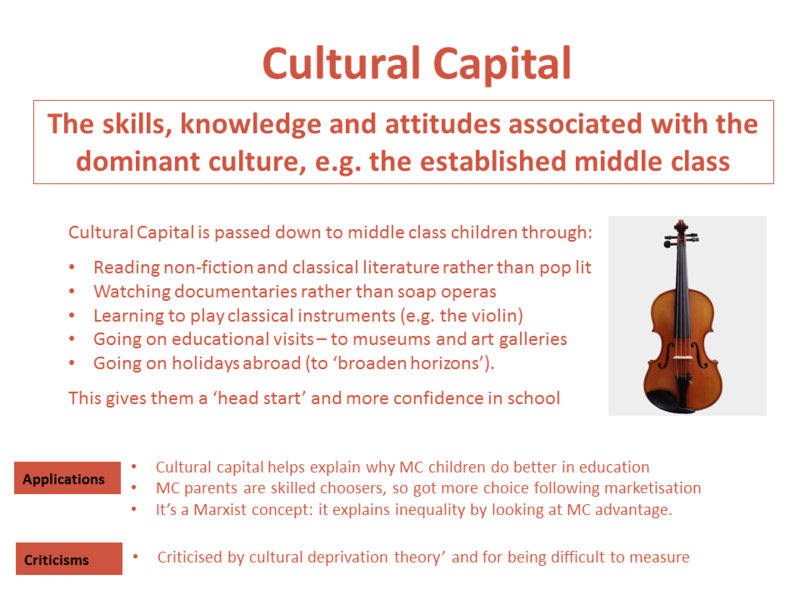 Cultural Capital refers to the skills and knowledge middle class parents have that they can use to give their children an advantage in the education system. A closely related concept is Social Capital – which is the support and information provided by contacts and social networks which can be converted into educational success and material rewards. Diane Reay (1988) – Mothers make cultural capital work for their children. Her research is based on the mothers of 33 children at two London primary schools. The mothers of working class children worked just as hard as the middle class mothers. But the cultural capital of the MC mothers gave their children an advantage. Middle Class Mothers had more educational qualifications and more information about how the educational system operated. They used this cultural capital to help their children with homework, bolstering their confidence and sorting out their problems with teachers. Stephen Ball argues that government policies of choice and competition place the middle class at an advantage. Ball refers to middle class parents as ‘skilled choosers’. Compared to working class parents (disconnected choosers) they are more comfortable with dealing with public institutions like schools, they are more used to extracting and assessing information. They use social networks to talk to parents whose children are attending the schools on offer and they are more used to dealing with and negotiating with administrators and teachers. As a result, if entry to a school is limited, they are more likely to gain a place for their child. The school/ parent alliance: Middle class parents want middle class schools and schools want middle class pupils. In general the schools with more middle class students have better results.. Schools see middle class students as easy to teach and likely to perform well. They will maintain the schools position in the league tables and its status in the education market. For the sociologists in this section, the cause of lower class failure is the very existence of inequality itself in society and differences in power held by the working and middle classes.